For albums 91-100, a look 10 records that either followed or ignored standard pieces of business advice. Business Tip #1: When starting a partnership, don’t choose a partner just like you. Outkast followed that guidance and have reaped the rewards of complementary skill sets. Big Boi is the more conventional rapper, albeit with lightning fast delivery at times. Then there’s André 3000 – a voice so obnoxious that it works brilliantly. He is a wizard at the a-cappella-run-on-sentence, later with Roses and here with Miss Jackson. “Forevah-evah?” Genius. For me, Public Enemy’s late 80s/early 90s work remains the benchmark for the genre, and there are some parallels here. Without the levity provided by Flavor Flav, Chuck D’s relentlessness would be overwhelming. If Stankonia were all Big Boi it might get exhausting and all André all the time might be a bit much. The difference here is that André is no sidekick; this is an equal partnership (as demonstrated with each getting their own CD on the subsequent double album Speakerboxxx/The Love Below). 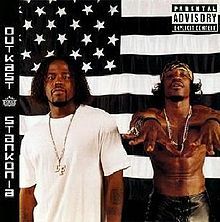 Currently exploring solo projects, it would be a shame if Outkast doesn’t reunite; when they were on, they were arguably the best duo in the business. I was really pleased with this album. I loved them WAY back… and so when I heard So Fresh and So Clean, Mrs. Jackson, I was happy. I think Andrew is very talented.